This summer visited my born town Ustí nad Labem (CZ) a very special guest, perharps the most widely known living TATRA driver Mr Karel Loprais, because of the supporting project for tourism „Trofeo Niké Bohemia“. 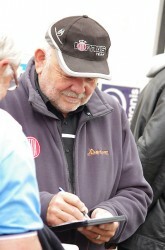 Mr Loprais is a sixfold Winner of Rallye Paris-Dakar in trucks. That is why I had to let him answer my several questions. Racer Karel Loprais and oldtimers homeland studies „Trofeo Niké Bohemia“ – how could those topics join? How was this relation created? The most important relation is the fact that my Tatra 815, my most successful truck which we were 3times 1st and ones 2nd, has become an oldtimer too. However, I have been linked with this project for several years. For me it means to relax, enjoy my job as well as entertain myself. Your favorite Rallye Paříz Dakar moved to Southern America. It is said that the new race is more difficult. Do you think so? Well, I have not driven the America yet. Main reason is that it is more safe area, nobody shoots. Comparing the African conditions – we passed more sand areas which were more comfortable for me. Could we say that this difficult rade has been becoming harder and dependent on better technology or on the contrary is open for less strong racers and teams? Well, I do not think that the race became harder. Basicly remains the same in the terms of racer requiremnets. What could change the face of the race is the fact that before both racing teams as well as the supporting escorts drove one route. High or even equal requirements were for the mobility of supporting excorts which influenced the total score of the whole team. Today the racers drive their own journey and their teams drive more comfortable way towards the finish. This is even the new face of new period. Could you sketch what do you think is the strengthness of Tatra trucks? Why is the leader among the competition? Definitely it was, even it is the chassis! The axle oscillation is unique for Tatra in the whole world which permits Tatra exceptional terrene transmitance. Thank you and have a safe way back home!